Uncharted 2: Among Thieves has a new game mechanic (stealth) and a new dead famous guy (Marco Polo). Both we knew. What are some things we didn't know about Uncharted 2? Creative Director Amy Hennig tells EDGE magazine, "Our last story was about Francis Drake... Our 'what if' was: what if Francis Drake hadn't died when everyone thought he had? This time we're going with Marco Polo. Our catalyst is this man who catalogued all of his journeys — all the details of everything that happened in his life — but despite that he left one gaping hole." That hole is 1292. Polo left Kublai Khan's court for Venice, commanding a fleet of 14 treasure-laden ships and a crew of 600 plus men. By the time he arrived home in Venice, he was down to one ship and a dozen or so survivors. "He never once said anything about what happened to him... And on his death bed, after people had called him a liar for what he had spoken about in his book, he said: 'I didn't say even half of what I saw.'" In Uncharted 2, the game kicks off with the search for Polo's fleet and moves on to Polo's real secret: the Tibetan city of Shambhala, also known as Shangri-La. Gone are the rich foliage of the first game, and in its place, snowy mountains and the war-torn urban Tibetan streets. 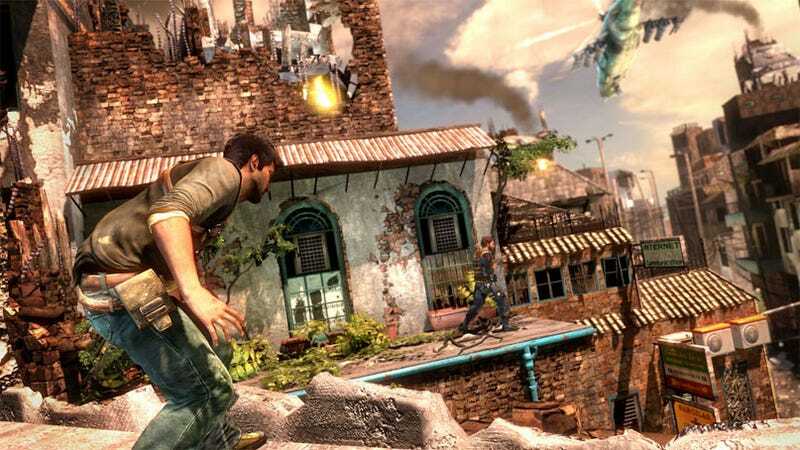 The game also explores the "shadier" side of hero Nathan Drake, who, as Naughty Dog points out, is sometimes "a jerk." Besides a new gritty feel, Uncharted 2 brings a new mechanic: Stealth. Developer Naughty Dog calls it "action stealth" — when or when not to enter combat. Another new? Drake also has a new love interest, a treasure hunter named "Chloe." The developer is wringing more out of the PS3's horse power with Among Thieves. Naught Dog co-president Christophe Balestra explains: "Uncharted used 30 percent of the PS3's SPUs, and this time we're maxing it out. That means we can blend and switch the animations a lot quicker, and we have more facial joints in-game for characters to react with believable expressions." "We didn't want things in the game that stop people dead. There's a connection between games people have finished and games they love — so we didn't want to put up too many walls along the way," says Naughty Dog co-president Evan Wells.